Anyone who takes blogging seriously knows just how much goes into creating blog posts from start to finish. Everything from researching a topic, finding search worthy content, writing a kickass post, adding affiliate links, creating graphics, sharing them on various platforms and then analysing their performance, can be quite something. 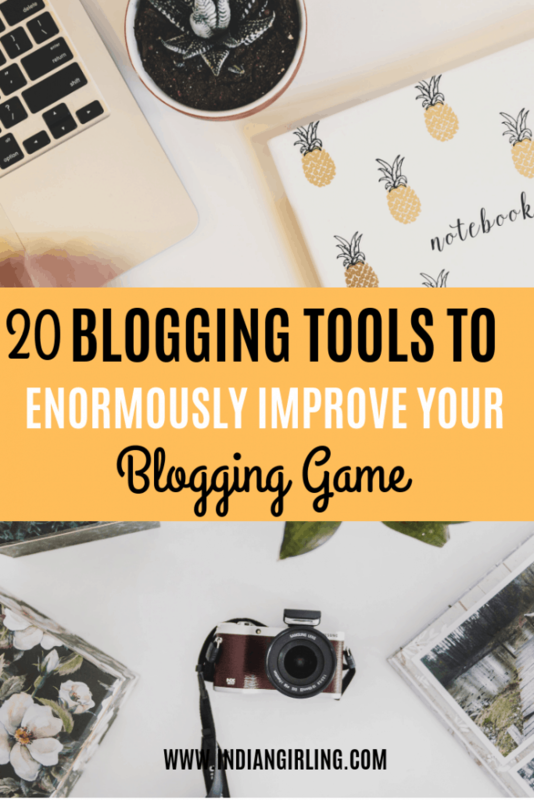 This is where knowing which blogging tools to use and how to benefit from them makes all the difference. The number one thing you need to run an efficient blog, is a hosting platform. I have talked in much detail why you need a self hosted platform and without this one essential tool you can forget about being a professional (or even semi-professional blogger). Many bloggers sing praises about Bluehost but every blogger that has grown beyond beginner traffic has migrated to a different hosting platform. Why is that, I wonder? Amazing affiliate program aside, Bluehost is not the best platform when it comes to empowering fast growth. Not to forget the 24*7 support at Siteground is insanely helfpul for a technologically retarded blogger (raising my hand). They offer free migration support from whichever platform you are on. The plans are flexible and based on actual growth. I would highly recommend the ‘Grow Big’ plan as it has access to premium features. The Cloudfare CDN Support and the Super cacher are free and incredibly awesome to keep your website super fast. The live chat support and constant support is amazing. For $1 more, you get a hosting platform that can actually scale with you. WordPress is the popular content management platform that almost every blogger worth their salt will use. Depending on your host, installing wordpress is easy and intuitive. Please note that there is a HUGE difference between self hosting your blog and using wordpress.ORG vs. hosting and using wordpress.COM. To find a step by step break-down of how to start a blog, click here. No self hosted blog with a domain name is going to be enough. The front end of your website is extremely critical to your blogging growth. 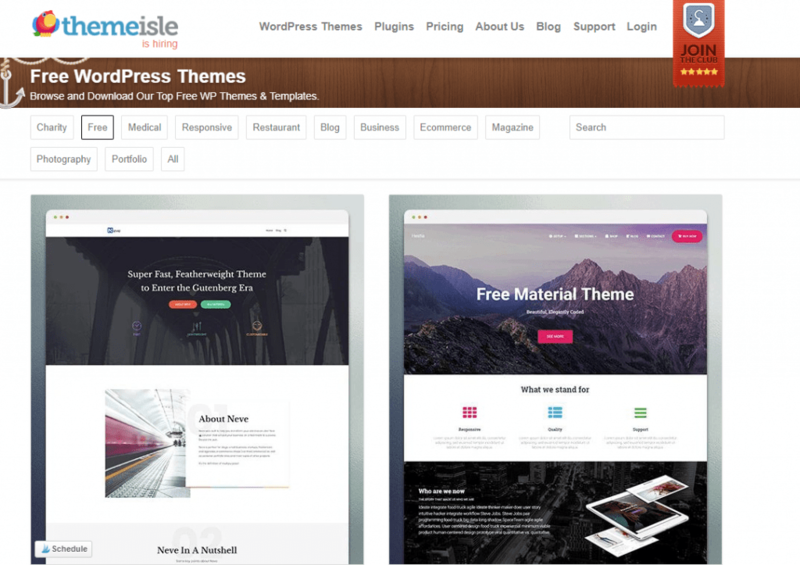 Theme Isle offers a ton of wordpress themes, many of which are free and multiple priced options. No matter which one you pick, you need to pick one! 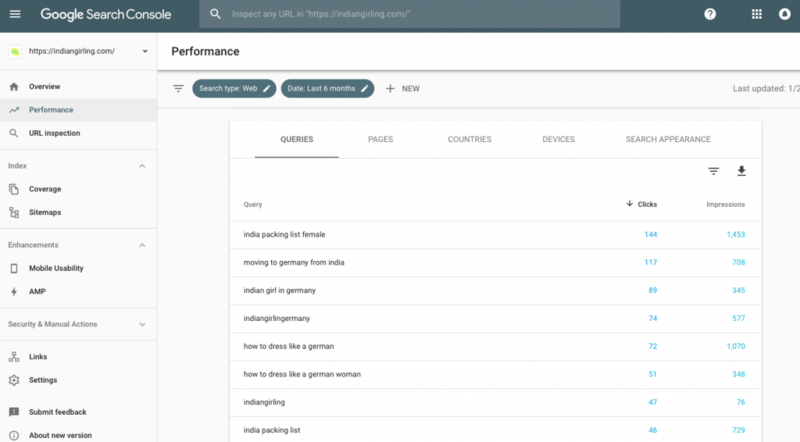 A keyword research tool I recently discovered, and find the easiest SEO (search engine optimization) tool to use, Keysearch should be a part of your content strategy! As a critical element of content marketing, it is not only important that you write on something you are passionate about, but also what your audience actually wants to read. These two things are not always the same. Check out the competitive score of any keyword you aim to target. Limited to 5 searches on the free tool. Another tool that is critical for generating ideas and understanding what works best is Buzzsumo. The free version is limited and only lets you see the last one year’s data. All you have to do is enter the keyword or the domain you want to snoop on, and voila! You get the top results along with the number of social shares by each platform. This is perfect for understanding which type of content is likely to do better where. Paid options are also available, but I don’t see an urgent need for this as a one person army. Larger companies with higher content turnout may opt for the paid version. The headline analyzer provides you a score based on various parameters such as intellectual/emotional/spiritual and other copywriting elements. For a super clickworthy headline, especially for Pinterest, you need a score that is in the 50-70% range. Fun fact: I actually tested two different headlines for the same blog post with a score of 30% and a score of 50% on Pinterest, keeping all other things fairly constant. For the post with the 50% headline score, I got 5x more referral traffic. For more such Pinterest marketing tips, click here. Once you are writing a keyword optimized, kickass headline post, what next? More often that not, you would want to proof read, especially for the most common mistakes. 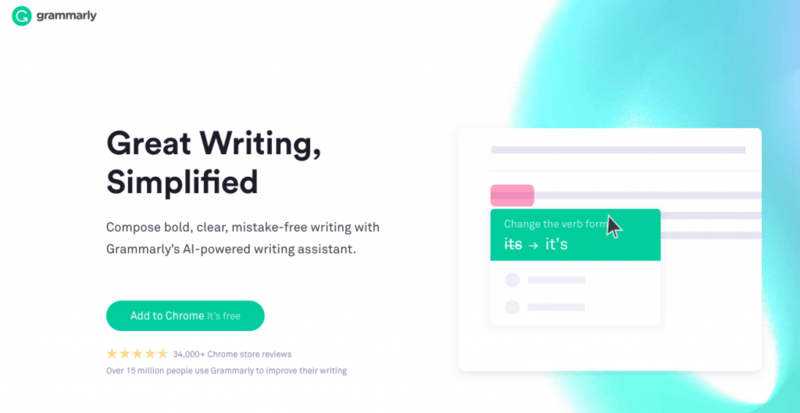 Grammarly, is like having a free virtual assistant who minutely checks into every mistake you might possible make. The easiest way to use this tool is to install an extension in your chrome browser and then it works automatically. If you don’t use Chrome you can also use the web version and copy paste your text to find out what you need to change, although that is the slightly more painful option. The one tool I cannot live without is Canva. Pretty much every graphic you can find on my website, social media marketing channels, email newsletters as well as landing pages had some help from Canva. I particularly love creating Pinterest images on Canva and I talk here about how using Pinterest has changed my (blogging) life. And it’s free. What more can you ask for? As a blogger, you often need free stock photos that can be used without copywright. This is where Pixabay is an amazing tool. I find it particularly relevant for the large collection of various photos. Another amazing addition to the list of blogging tools, for finding stock photos with a more artsy effect is Unsplash. I often compare pictures I find on Pixabay and Unsplash and then pick the one that I like more, depending on my theme and content. More choice never hurt anyone! An excellent Q&A platform that regularly makes up about 8% of my referral traffic which also happens to be high quality. If you have a blog that is about anything that may solve anything, chances are people on Quora are looking for it. 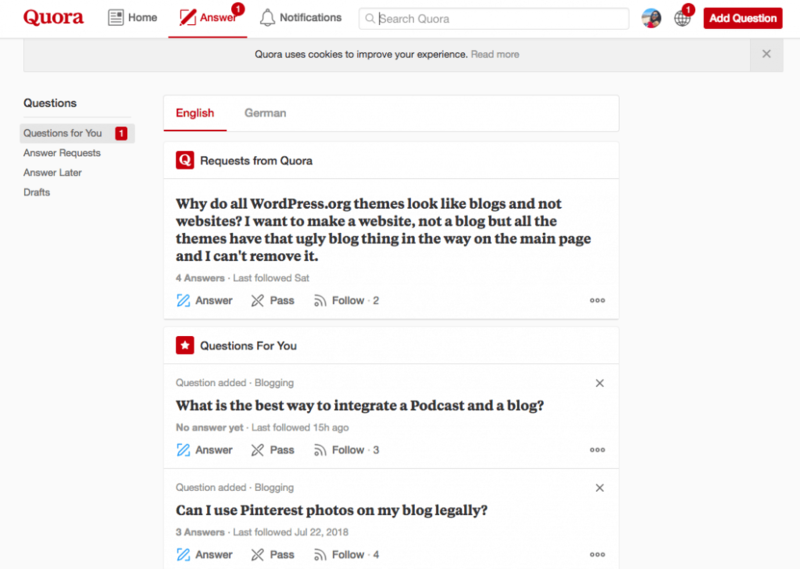 One of the ways to organically and also directly increase your referral traffic is by being a thought leader on Quora. You can do so by regularly answering questions to your blog’s target audience and dropping links that actually help add value to your answers. Over time, you can increase your followers and really follow a good content syndication strategy for all your new blog posts. A popular blogging platform, with some of my all time favourite articles, also doubles up as an excellent place to share your blogposts. Since the quality of articles on Medium is generally high, it takes a LOT of time and interest to build a following, but it’s still worth checking out. What’s also amazing is that Medium can work as an extra revenue stream. All you have to do is sign up for the Medium partner program, and the more people that read and like your content, the more money you make! Another top platform for generating traffic for your blog posts is Mix. 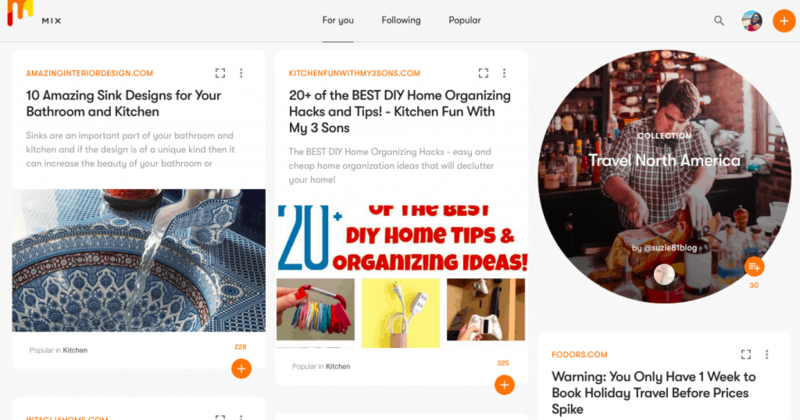 It’s the new version of stumble upon and can work as an excellent place for inspiration for new content as well. Although I am yet to find a concrete traffic spurt from syndicating content on Mix, I still think this is a tool that must be utilised especially if you blog in the field of technology, news or business. In the rare case, that you are a blogger who has not heard about this tool or somehow overlooked it (which I did as a hobby blogger and seriously regret), here is one master stroke that is free and limitless for everyone! 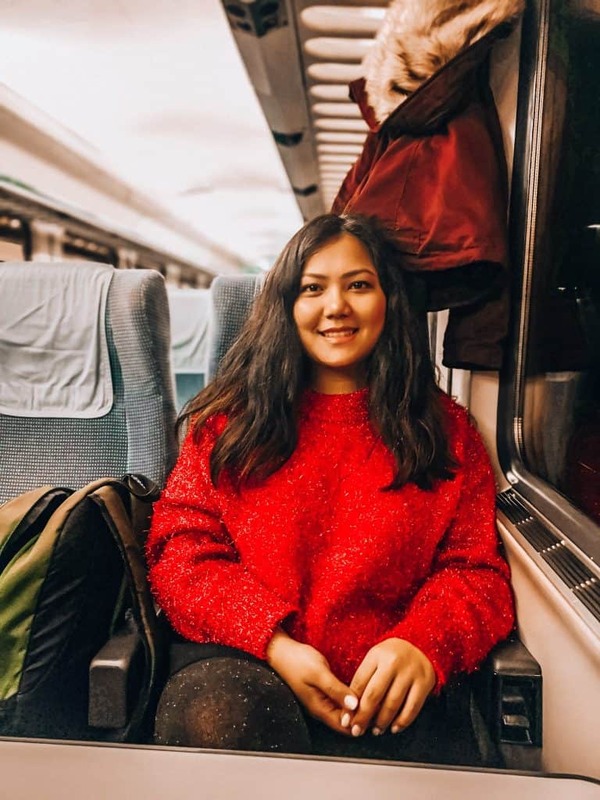 A social media platform based SOLELY for finding content and content creators, albeit heavily biased towards female audiences in the english speaking world, but still! There’s things you can do and a speed which you can grow at on Pinterest which is just not possible with Facebook, Instagram or Twitter. My combined reach on Pinterest climbs every month, based on the number of experiments I run. Some of my pins have climbed up in Google SERP rankings, solely because of the amount of times my content was shared and re-pinned. For example, this post alone has helped me soar to the first page of google within less than 2 months of writing the post. Which other platform is that powerful? None, as an online business or a blogger you NEED to leverage this platform, especially more so if you blog in English and a huge chunk of your target audience is based in US, UK, Canada and Australia! As a person with a full time day job and night time blogger, I cannot function without this blogging tool. 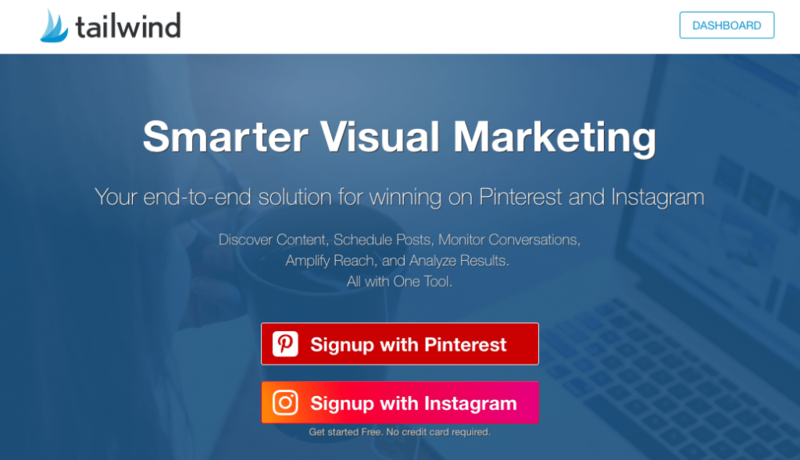 The free trial option gives you the possibility to schedule 100 pins (Pinterest) and 30 Instagram posts without having to pay a penny. This is a pretty neat feature especially if you want to get a hang of the tool and whether or not this makes sense for your blog or business. I have been a paid user since pretty much forever and schedule anywhere from 50-70 pins per day, across my 70+ boards, which averages to be one pin per board per day. I am also a part of 5 tribes with millions of users, thus expanding my reach manifold. The thing that I find most useful about Tailwind is though, the detailed analytics it provides. You can see which boards perform best, which posts perform best and even run a smart loop that re-pins evergreen content that you can pick and choose. I also particularly like the free instagram scheduling option as I definitely do not post more than 1 time per day, but to keep engagement going, I prefer to schedule my posts way in advance. If i could count the hours this tool has saved me, especially for Pinterest, I couldn’t possibly add those up. For less than $15 a month, this tool is a must-have! Click here to try the tool for free for 1 month. I have to say, I have been positively surprised by this excellent social media marketing platform. As a newbie blogger, you most likely will not need this. But if you are dependant on Facebook and want ALL your social media scheduling and analytics in one place, this is a must have tool. Not only can you connect and schedule posts for pretty much every platform, you can also have a neat overview of the growth and statistics for your accounts month on month. If you are some one who makes money online especially from social media, you should definitely give this tool a try. Another tool I discovered by accident by looking for an easy way to receive growth reports across all my social media channels. Sum All helps you connect to various social media platforms and not only automate your content but receive daily and weekly reports of progress. I don’t have the time to go every day on every social media channel and note down progress on followers and engagement. Those of you with busy facebook pages, know exactly what I am talking about! Sum All takes care of this for me, for free! You know how you keep reading website speed is critical for SEO and for lower bounce rates? Yep, how exactly do you go about checking how quick or slow your website is? The easiest and fastest way to do it is to use Google Page Speed Insights which give you a basic report and errors you can fix. Based on this, if you are not a professional website developer, you can always hire a person on Fiverr to speed up your website. Click here to get 20% off on your order with Fiverr. The number one I need and perhaps the only tool I need to measure my keyword positions, impressions and changing rankings is to have access to the Google Webmaster Tools. There’s a bunch of cool things having access to these tools can help you with, the favourite of mine being Google Search Console. Once you have added your property (meaning website) and verified this platform will start to crawl your website and collect powerful data over time. A good keyword tool is not sufficient, since you also need to closely track your search engine optimization for your domains. How better to do that, than with free tools that Google (oh, so graciously) provides? The other thing I totally love about this tool is to check my entire backlink profile. Many people either do not know about this feature or simply overlook it. I discovered it by accident and closely track it to look for any new websites that may have linked back to me! Of all blogging tools that can help you understand and improve your online game, Google Analytics is by far the MOST powerful tool out there. You don’t need to be a math or analytics nerd to understand it either. Google offers plenty of free tutorials for you to become an advanced user, and many of the features are easy and intuitive to understand. With Google Analytics, the sky is the limit! I have also used other google tools such as the Google Keyword Planner and Google Trends, but have been sorely disappointed by the lack of depth. Many free tools are far better as keyword research tools, than the one google offers. Nevertheless, there’s still plenty of free tools to empower your websites! What are your favourite blogging tools? Comment below for some new ones! Want to keep the post for later? Pin it! Awesome suggestions, especially ones like Quora, I’ll have to give them a go! This is great. I’m only a month into blogging and I’m always looking for advice from veterans. I am using some of your suggestions already but I plan on using a lot more. I didn’t know you could submit articles on Medium so that’s awesome to know! Also thanks for sharing a free keyword search, I’ve been looking for one! The keyword search and SEO information is so helpful. I have already saved it for later! Hi there, thanks for your kind comments! the site is running on Divi, but I did have a web designer create what I wanted to see. I am quite happy that you liked it!